Disclaimer: Due to multiple conflicting reports, all the numbers provided in this article are estimates only. JWJ-P1 system, Curse region. On the 6th of December at 20:45 EVE Standard Time, The Initiative. [INIT.] clashed with Mercenary Coalition [MC] and Northern Coalition. [NC] over a tower in the system. According to Mercenary Coalition, the alliance was given a contract to hit towers in the Curse region belonging among others to The Initiative.. This sparked a series of engagements with The Initiative. which grew in size and scale, attracting the attention of other entities such as Northern Coalition.. With the contract nearing completion and only one timer remaining in the JWJ-P1 system, the two alliances came up with a plan to force The Initiative. to commit and possibly lose a capital force. As preparation for the trap, Northern Coalition. scouted a wormhole route from its staging to the target system and assembled a 120 pilot Ishtar heavy assault cruiser fleet. This force waited on the other side of the wormhole for Mercenary Coalition’s signal, who had its own Ishtar fleet estimated at 80 pilots. This force made its way to the JWJ-P1 system and warped on top of the tower, dropping its payload of sentry drones and getting into its maximum drone control range. The Initiative. at the time was organizing its own fleet, a 90 pilot Rattlesnake battleship force complete with two triage Chimera carriers. With Mercenary Coalition forces on the field and shooting the tower, The Initiative. bridged its fleet on the tower itself, starting the battle. The Rattlesnakes dispersed their own sentry drones and the two fleets exchange fire over long distance, the Rattlesnakes adding flights of cruise missiles to their drones’ fire. The Ishtars attempted to spread their sensor dampeners across the Rattlesnake fleet but were unable to do so effectively. In rapid succession Ishtars simply exploded as the missile and drone fire overwhelmed the cruiser hulls. As the tide seemed to go against Mercenary Coalition, a cynosural beacon was lit on top of The Initiative.’s triage carriers, bringing forth three Mercenary Coalition dreadnoughts. However, these were soon countered by The Initiative., which brought a whole dreadnought squadron of its own. An ugly fight erupted at close range as the dreadnoughts fought each other, the Mercenary Coalition dreadnoughts decidedly losing, overwhelmed by the damage output of the combined Rattlesnake fleet. Unknown to The Initiative., this was the moment Mercenary Coalition was waiting for. Signaling Northern Coalition., Mercenary Coalition quickly bubbled The Initiative.’s dreadnoughts while waiting for the Northern Coalition. reinforcements. yet Northern Coalition. was held back from reaching the system in time, causing Mercenary Coalition to over commit its fleet. This resulted in greater losses, especially of the many interdictors into which Mercenary Coalition pilots re-shipped time and again in order to keep The Initiative.’s capitals tackled. Finally, Northern Coalition. entered the system, warping at maximum range of the Rattlesnakes and deploying its own sentry drones. Another long range battle was fought. This battle though, proved a lot less one-sided than before, as the greater number of Ishtars the Northern Coalition. fleet had allowed it to spread sensor dampeners more effectively. The two sides struggled bitterly to overcome each others’ logistics wings, with the Ishtars managing to break several Rattlesnakes thanks in part to their rapid target switches which left The Initiative.’s logistics wing behind. As Northern Coalition. seemed to command the field, the logistics wing of The Initiative. fleet was decidedly broken. Many Basilisk and Scimitar logistics cruisers were torn to shreds by the sentry drone fire and the two triage Chimera carriers also went down. However, The Initiative. quickly supplemented them with two new ones, fitted to better tank the incoming damage. By this point, The Initiative. managed to extract most of its dreadnoughts, only a couple remaining trapped as Mercenary Coalition seemed to have run out of interdictors. As the second pair of triage Chimera carriers was slowly overwhelmed by Northern Coalition., two new fleets entered system. One was a Spectre Fleet Phantasm cruiser fleet estimated at 100 pilots and the second was a Providence Bloc Cerberus heavy assault cruiser fleet, estimated at 80 pilots. The two fleets made contact with the Northern Coalition. fleet commanders and a temporary ceasefire was declared between the three fleets as they focused on the remaining The Initiative. capitals. With such an array of force lined up against it, The Initiative. 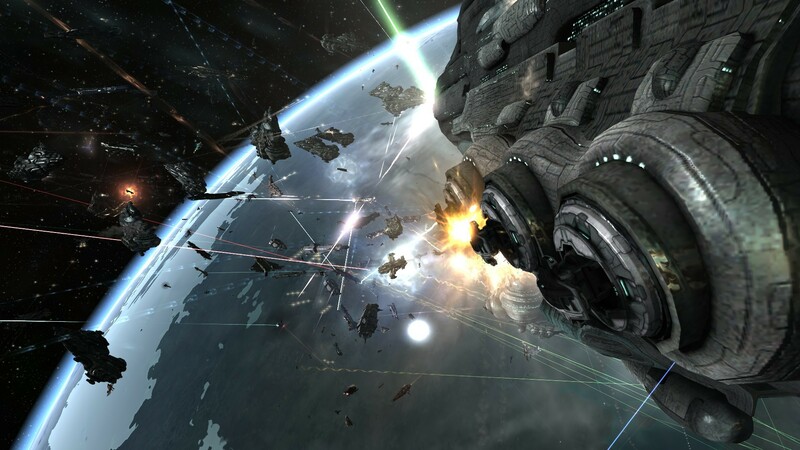 fleet chose the only realistic option it had and retreated into the tower’s shields, abandoning the remaining triage carriers and a lone Naglfar dreadnought which remained tackled. The Initiative. then withdrew from the system, allowing the three hostile fleets to do as they pleased. While Northern Coalition. removed the last Naglfar, the Spectre Fleet force and Providence Bloc briefly exchanged fire on the grid. With The Initiative. gone and having fought a long and exhausting battle, Northern Coalition. extracted as well. Mercenary Coalition forces did not re-form for the tower, instead allowing The Initiative. to keep it. As for the Spectre Fleet and Providence Bloc forces, they too left after a short fire exchange, moving further into Curse to continue their fight. Thus ended large scale hostilities in the system. Battle report for the JWJ-P1 system can be found here. All told, the fight lasted nearly an hour and a half with Time Dilation not reported as an issue. However, the exact number of players in the system during the fight cannot be accurately gauged. An educated guess puts it at around 400 pilots near the end of the fight. The Initiative. lost 40 ships including 1 dreadnought, 4 carriers and 8 battleships for a total of 20.46 billion ISK damage. The allied fleet lost 106 ships including 3 dreadnoughts and 24 heavy assault cruisers for a total of 21.97 billion ISK damage. Tags Curse JWJ-P1 Mercenary Coalition Northern Coalition Providence Bloc Spectre Fleet The Initiative. Hey there. I found your blog by the use of Google whilst looking for a related subject, your website came up. It seems great. I have bookmarked it in my google bookmarks to visit then. Hello there. I discovered your blog by means of Google while searching for a comparable matter, your site got here up. It appears to be good. I’ve bookmarked it in my google bookmarks to visit then. Hello there. I found your blog by way of Google even as searching for a related subject, your website got here up. It appears great. I’ve bookmarked it in my google bookmarks to visit then. Hi there. I found your website via Google whilst looking for a comparable topic, your site got here up. It appears great. I have bookmarked it in my google bookmarks to come back then. Hi there. I found your web site via Google while searching for a related matter, your site got here up. It looks great. I have bookmarked it in my google bookmarks to visit then. Hi there. I discovered your blog by way of Google even as searching for a comparable subject, your website got here up. It seems to be great. I have bookmarked it in my google bookmarks to come back then. Hiya, I’m really glad I have found this info. Today bloggers publish only about gossip and internet stuff and this is really frustrating. A good blog with interesting content, that’s what I need. Thank you for making this web site, and I will be visiting again. Do you do newsletters by email? Hiya, I am really glad I’ve found this info. Today bloggers publish just about gossip and web stuff and this is really frustrating. A good blog with exciting content, that’s what I need. Thank you for making this site, and I will be visiting again. Do you do newsletters by email? Hiya, I am really glad I’ve found this information. Today bloggers publish only about gossip and net stuff and this is actually irritating. A good blog with interesting content, that’s what I need. Thank you for making this site, and I will be visiting again. Do you do newsletters by email? Hey there. I discovered your site by means of Google while searching for a similar matter, your site got here up. It looks good. I’ve bookmarked it in my google bookmarks to visit then. Hiya, I’m really glad I have found this info. Nowadays bloggers publish just about gossip and web stuff and this is actually frustrating. A good web site with interesting content, that’s what I need. Thank you for making this web-site, and I’ll be visiting again. Do you do newsletters by email? I wish to start my own blog: exist such point as blog sites that are entirely “open”, as well as anyone can view it? I maintain concerning the kind where you need to add other “pals” to utilize the website. Hyperlinks appreciated. Thanks!. Hi there. I discovered your website by way of Google while searching for a comparable topic, your site got here up. It seems to be good. I have bookmarked it in my google bookmarks to visit then. Hiya, I am really glad I have found this info. Today bloggers publish just about gossip and net stuff and this is really frustrating. A good website with interesting content, this is what I need. Thanks for making this web site, and I will be visiting again. Do you do newsletters by email? Hi there. I discovered your blog by way of Google while looking for a similar topic, your site got here up. It appears great. I’ve bookmarked it in my google bookmarks to come back then. Hi there. I discovered your blog via Google even as searching for a comparable topic, your web site came up. It seems to be good. I’ve bookmarked it in my google bookmarks to come back then.